Everyone's favorite kitty boy is ready to colorSkippy style! Skippy's sky will be pink. His sun will be blue. 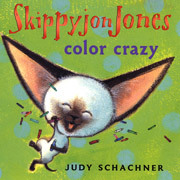 As Skippyjon learns his colors and plays with crayons, he invites the very youngest fans to join in the fun. Who knows what color our mischievous Mr. Fuzzypants will be!